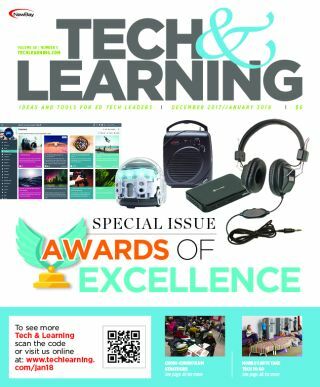 Contributing editor Ellen Ullman asks our T&L Advisors for their predictions on what they think will be the hottest edtech in 2018. T&L congratulates the winners of our 35th annual Awards of Excellence program. You can find summaries of these winning products on the following pages, along with comments from our judges. Innovative educators know that students preparing for the challenges of work and further study in our ever-changing world need to achieve fluency and comprehension—but they also need to develop higher-level thinking skills and build deep knowledge. The following schools and districts are using edtech tools to integrate literacy skills across the curricula. Today’s K-12 classrooms continue to host a wide variety of tablets, laptops, and Chromebooks, making charging carts an essential component of any 1:1 or BYOD program. What follows are some of the latest offerings. EDITORS DESK: HAPPY NEW GEAR! ● T&L READER SURVEY ARE YOU USING AUGMENTED OR VIRTUAL REALITY IN YOUR SCHOOLS?